The Middle East conflict - war in Syria and Iraq - has already spilled over. No one is safe from the terrorist attacks, neither East, nor West. Islamic State claims it is still strong, and its ideas are attracting new recruits to replace those killed on the field. Islamic State says the horrors it perpetrates are done in the name Allah - spurring resentment against Muslims all across the globe. 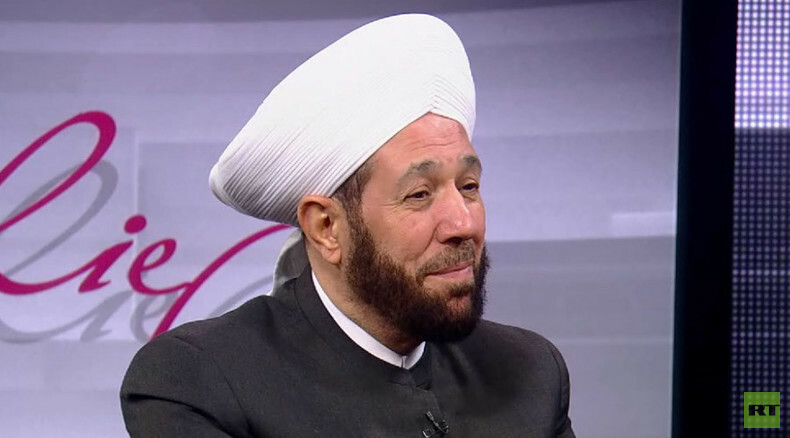 Today, we speak to an Islamic scholar, a Grand Mufti of Syria, Ahmad Badreddin Hassoun, to see how the jihadists have twisted the idea of Islam. And does their agenda have anything to do with Islam at all? Sophie Shevardnadze:Thank you very much for being with us today. This is a great honor. We are delighted to have you, because there are so many things we want to discuss. You said that there is no such thing as a religious war, there are only political interests. But ISIL fighters want to conquer the whole world, they use Islam as their banner and call this fight a religious war. Are they guided by political interests? Ahmad Badreddin Hassoun: First of all, I want to express my gratitude to the Russian Federation, because it sided with the truth. It did not separate Syrians by their Shia or Sunni background. It decided to support the Syrian people as a whole. Syria is a secular, democratic society where different religious groups coexist – Christians, the Druze, Sunni and Shia Muslims. Those who call their wars religious, do so in order to provoke radicalism among Muslims. This of course goes against the true Islamic culture, because a person with values will never commit the atrocities ISIL is known for. They use religion as a pretext for conflict and bloodshed. I think there are two kinds of Islamic State fighters – those who know nothing about true Islam and those who have some religious background, but they use religion to promote their own agenda and kill others. SS: How are ISIL leaders able to make so many young people follow them? They make them participate in violent acts, in combat – how do they do it? ABH: What ISIL is doing is not new. This organization has existed before – under different names. They convince their followers that they are guided by religious convictions, spread their ideology, spending a lot of money on that work. We must remember it. SS: Right! But they don’t buy these young people – they come from Europe, Russia, the U.S. young people from good families for some reason go to Syria and begin to fight for ISIL. How do Islamic State leaders achieve that? It does not matter how they name themselves. How do they do this? What goes on in people’s heads? ABH: We met with some guys who came from the UK, France. Many of them were Syrians. They come here to build some sort of Islamic caliphate. They think that they will promote Islam and spread it to the whole world. But we know that religion should not be preached with weapons – rather with love and solidarity. ISIL uses ideology to lead young people astray. But they do it for their own political purposes. Most of the people being killed in Syria today are Muslims. The majority of ISIL victims are Muslims! SS: But why do these young men join ISIL? Why do young, healthy people that have good lives at home, go to fight for Islamic State? ABH: Many young people go abroad, because they want to follow a new ideological trend – radical Islam. They are lost, and leading them back on the right path will take some serious effort. They end up with the wrong people, believing they can wage war in the name of religion. Now, after Russia began to bomb ISIL targets in Syria, many young Islamic State fighters ran off. What happened to their convictions? They fled. If you want to create a true state, you need to build it on the basis of political values and democracy. We don’t impose any religion in Syria; we don’t say that there must be a Christian state, a Jewish state or a Muslim State. These ideas come from outside. The West is instigating such ideologies. The West is playing a big part in the process. I think a state should be founded on strong political and cultural elite. What we see in Syria today is similar to what happened in Yugoslavia - Croatia, Bosnia. There were major cultural elites there. But the West began to provoke different political and religious groups in order to start a civil war, which resulted in manslaughter. SS: We will talk more about religion. But first I wanted to ask you about extremists. Pope Francis warned about ISIL fighters entering Europe as refugees. Do you think Europeans should look at every refugee as a suspect? ABH: Are all refugees Syrians? Of course not! These are people from different countries turned into conflict zones. We see people from Afghanistan, Iraq, Chechnya, Tajikistan and Libya. They are all running to Europe. And many of them have radical convictions. That’s true. Europeans allowed this ideological trend to develop freely, they let radical Islam spiral out of control. I have seen this in France, the UK and the U.S.. There are Islamic centers financed by Saudi Arabia. These centers became magnets for new extremists, who later travel to the Middle East and start wars there. You reap what you sow. Now we are seeing the results of this policy. SS: So today terrorism is a trend? ABH: Terrorism is a dangerous political trend. It is also a cultural trend. And we have to study it in order to fight it. ISIL is trying to promote its political agenda through violence, using weapons. They tell their followers that they will go to paradise, “If you murder people, you will end up in paradise.” But this goes against the Prophet’s teachings, because, of course, nobody gets to paradise using these methods. We need to preach the idea that a person gets to paradise through cultural enlightening, education and solidarity. SS: You’ve said many times that what is happening in Syria now has nothing to do with religion. Why is it that those who fight for the opposition, for ISIL, don’t hear you? Why are they not listening to you? ABH: Most of those who are now fighting for ISIL came from other countries. They are not Syrians. They come from China, Russia, Europe… And the organizers of this movement indoctrinated them. So the fighters are not listening to us. Many of them don’t even know anything about me. Syria has always been a place where different religions co-existed in a civilized manner within one country. We’ve had different eras – Christian and Muslim conquests. But in the end there was always peace. For two thousand years we did not have people murdered for religious reasons in our land. Syria has never had a strict religious government system, unlike Lebanon, for example, where the president must be a Christian, and the Prime Minister – a Sunni Muslim. We could never imagine something like that in Syria. The current conflict is not about religion. Syria is an ancient country. I think what is happening in Syria today is a result of a conspiracy. SS: But, conspiracy or not, people will always be people. There are good people and bad people everywhere. For example, I remember how Islamists in Egypt were burning Coptic churches, and Muslims created a human shield around the churches, so that Christians could worship in peace. What is the situation in Syria like in this respect? Do Syrians help Christians, the Druze? ABH: In Egypt it was different. It was all internal. There was not much external interference there, no Blackwater personnel, for example. Egypt changed its political regime on its own, whereas in Syria the attempt to overthrow the government was orchestrated from abroad, by other countries. Syrians were provoked. But we are still there, despite the conspiracy. SS: I am also asking about regular Syrians. Do they help Christians to survive, Christians who are also being attacked by ISIL extremists? Do they help each other in Syria? ABH: Of course, we are afraid for our Christians. But, to be honest, we don’t divide our people into Christians and Muslims, we protect all Syrians. There are many Christian politicians in our country. Our former defense minister is one of them. We don’t make a distinction between Christians and Muslims… We live as one family and protect each other. We don’t divide people into the Druze, Sunni or Shia Muslims, and Christians. So, we are very concerned about the fact that so many Christians are now leaving the region. We will never let the situation get to the point where there are no more Christians in Syria, because this country also belongs to Christians. Of course, Islam recognizes Jesus Christ, as we all know. We don’t reject Mother Mary, don’t reject Jesus. Whereas ISIL doesn’t think about Christians, they just follow their own agenda. And fighters from different countries help them. That’s why we are now standing alongside Russia and believe that our strong friends will help us, because together we are strong. As for religion, today it is used to divide countries, to create so-called Islamic states, which would basically be weak states under Western control. SS: Thank you again for being with us today. I want to talk more about ISIL. ISIL is not just fighting against everybody, right? They are also trying to create a state, with certain social institutions - education, etc. They pay salaries, give money to the poor. It may even seem that at times they are doing it better than the actual state – at least judging by the number of their followers. ABH: I can’t quite agree with you. We see what is really going on there. They just steal the money. They steal the money, their business is contraband. They steal oil from Syrian and Iraqi fields and smuggle it out. They sell it at a low price to whoever is willing to buy it. So they are not just terrorists – they are also thieves and murderers. There is also money coming in from Qatar, Saudi Arabia – through so-called charities. They use the money to destroy our country, to destroy Syria. And the vicious cycle continues. Now ISIL fighters flee when they hear that Russian jets are coming. They left many Syrian oil fields where they used to steal oil and then sell it. So it is not a state, it is a criminal group. They are not trying to create anything. Look at what they’ve done in Palmyra. What state would do something like that? A true state will not destroy or sell historic treasures. Of course, they think that they are a state. But they are thieves, murderers and criminals. SS: Why do they destroy historic landmarks? What is their goal? They also destroy mosques. What do they get from that? Of course, they have ideological differences with people from other religious groups. But destroying landmarks and mosques – what’s the point? ABH: You tell me! Why did they vandalize the Iraqi museum? Nobody had ever done that. ISIL began its conquest in Iraq by ransacking the Mosul Museum. What for? ISIL wants to erase the history of our region, our legacy. The colonizers tried to do the same in South America, when they invaded the continent and tried to bring the locals to their knees, in order to tap the territories for resources. They also tried to erase the history. It is an attempt to rewrite history. This is how they plan to weaken the countries – rob people of their history. It is basically neocolonialism, but it is done through third parties. And of course they have some interests too. So they might use religious convictions as a pretext, but it leads to enslavement of people and nothing else. That’s what they’ve done. SS: Let’s get back to one perennial issue. I hope nobody will get offended, but it is very important for us to get an understanding of this. You always emphasize that radical ideologies have nothing to do with real Islam. And most Muslim spiritual leaders agree with you. But could you please explain to me: with Muslim clergy almost unanimously condemning extremism, why is extremism still so explicit in Islam? ABH: First of all, this is reaction. All this radicalization comes as a reaction to the enormous tragedies and frustrations that we’ve had throughout our history. For example, when the government doesn’t care about its citizens, when it doesn’t care about upholding religion, it certainly leads to the emergence of people who accuse the government of defying the foundations of religion. So extremism originally comes as a reaction to poor governance. Secular states, secular democratic nations, should undoubtedly support religion and their country's’ cultural heritage. They shouldn’t forget that religious and cultural heritage also plays an important role. And if you start destroying it, this may indeed lead to the rise of radicals as a kind of backlash. Religion and religious organizations must be present in society, because they are good for people. They provide not only for religious institutions or Islam as such, but for the entire public. They must be an indispensable part of the social fabric. But those people seek to set specific parts of society against the powers that be. In fact, much of what I’m talking about is evident in Europe. Do you remember the name of Germany’s major political party? It’s the Christian Democratic Union. That is to say that Europeans follow those principles themselves, even though religion must indeed be isolated from politics, and should primarily remain a social and cultural institution. Therefore, I believe the government must reserve a role for religion to play. But we must be very careful in drawing the line between state and religion. Religion is first and foremost a path of spiritual development for people. Our children may belong to different religions, but we should not divide the country because of religion. It is the same in Russia. As far as I know, you have secular laws – the criminal code and other regulations. And they have no reference to religion, because all citizens must be treated equally. The bottom line is that we must distinguish between religious ideas and government policies. A number of states see themselves as religious states: Qatar, Saudi Arabia and Kuwait. President Erdogan aspires to do the same in Turkey. But in Syria, we do not use religion for political purposes, because religion must bring people together and teach them to love each other. We don’t want to use religion to oppress people. First and foremost, we need to approach religion globally, realizing that religion is one thing, and the state is something different. SS: Let’s talk about the current situation. Regional countries together with big powers are trying to reach a consensus on Syria’s future. They’re even talking about a dialogue between the government and the opposition. But who should President Assad talk to if most of his opponents are religious fanatics? ABH: The war has been going on for four years. All these years we’ve been inviting them to start a dialogue. Since the first day of the tragedy we started calling the opposition to come to the negotiation table. Russia encouraged the Syrian opposition to engage in talks three years ago. They refused. Today, their representatives visit Moscow. They agreed to participate in Geneva talks. So Russia has been calling for a dialogue for about 3 years. The Syrian government also sent 3 delegations to Moscow. We hold talks regularly. But we see that the so-called opposition is in no way a united organization. There are many groups fighting each other, fighting ISIL, fighting us. The Syrian opposition wants to recognize nothing – not talks, not Assad. When Russia launched an anti-ISIL military campaign, the initial response of the so-called moderate opposition was negative. Presently some commanders of the so-called Free Syrian Army say that they are ready to cooperate with the Russian Federation against ISIL. But we offer them to do more than that. What we want them to do is to act together against terrorists unconditionally. We see Western countries having a hidden agenda, and international players calling for compromise finding them under pressure. But Russia keeps urging the opposition to engage in a dialogue. But Russia’s calls often remain unheeded. Today a lot depends on the opposition sponsors. It’s them who make decisions, not the opposition itself. It has no independent opinion of its own. They say there should be a new government in Syria. But the government they want will be essentially a neocolonial government. We changed the Constitution for them; we held elections. Basically, we have a different government today. But they reject everything. The only language they understand is the language of weapons. That’s how they talk – with weapons. They destroy churches and mosques in the name of the so-called revolution. What kind of a revolution is this? You destroy your own country. You steal the country’s resources, destroy hospitals. SS: Still, President Assad is a controversial figure. Do you think it will be easier to achieve peace if he steps down? ABH: It’s not for me to decide. It is not up to me; it is not up to Bashar Assad. It’s up to the Syrian people to decide. SS: But what do you think personally? It’s important. ABH: I think if Assad steps down, this will result in a breakup of Syria. The reason they want President Assad to go is not to restore democracy. They just want to divide Syria into a number of small countries. We will only accept a decision made by the Syrian people. Let’s allow the Syrian people to speak. We have been hearing a lot of President Hollande, but the Syrian people aren’t allowed to express their opinion for some reason. Let’s stop listening to people from the U.S., the White House, the Élysée Palace, let’s hear what the ordinary Syrian people have to say. We have to let them talk. Just like it’s not up to Washington to decide who should be president of Russia, it’s not up to Washington to decide who should be president in Damascus. We will recognize the results of a fair independent election. It can be monitored by the UN or Russia. But they refuse, saying, ‘No, we won’t stop fighting until Assad is gone.’ But what is the alternative? Let’s say Assad steps down. What next? What is the alternative for the Syrian people? Let the Syrian people finally say something on the matter. SS: I remember when the Syrian conflict just began you said that if we didn’t stop the war immediately, it would drag on for another 10-15 years. What’s your prognosis now? Will this terrible conflict drag on until 2025, or is it possible to end it sooner? ABH: I hope it will end in 2016, that’s what I hope for, because we’ve begun making joint efforts in order to resolve this crisis. We can now see significant military success achieved on the Syrian-Lebanese border, with the army advancing towards the Syrian-Turkish border. Syria’s problem is external, not internal. Our problem is our so-called “friends and neighbors” that extend a helping hand to these terrorists. So when we clear the Syrian-Turkish border of terrorists there will be a dramatic improvement. The presence of the Russian air force coupled with the efforts of the Syrian army led to considerable success. Now a lot of territory along the Syrian-Turkish border has been cleared of terrorists. As for Idlib and Raqqa, we’ll continue operations there in the days to come. So I hope all the terrorists will simply scatter. I also hope your brave Russian pilots will come back home once peace is restored. SS: I want to ask you a very personal question. When terrorists killed your son, you forgave them and asked the judge to forgive them, too. How is that possible? How did you overcome the burning desire for revenge? Are there many people like you in Syria? ABH: It’s not the men that blew up his car that should be punished, it’s the people who finance them, the people who come to our country from abroad to do all of this. Of course I won’t forgive the radicals who urge people to kill, who put themselves above others, who say they’ve created some ‘Islamic state’, mutilating the very tenets of Islam. I condemn those people and I’m never going to forgive them because they are playing games with people’s lives at stake. It’s the leaders of the Gulf countries, Turkey and the America that should stand trial, because they supplied the arms. The weapons that killed my son came from them. To me, all the people who were killed at their hands are like my son. Every Syrian that died in this war is my son. SS: Mr. Mufti, thank you so much for the interview. I hope your voice will be heard by those who need it. I really hope that this war will end in the near future, because it has lasted for far too long. Thank you very much.